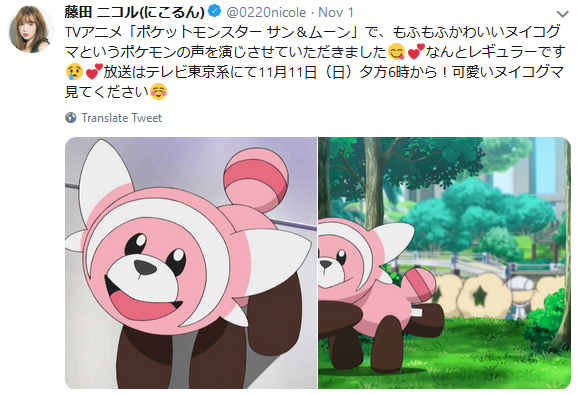 On November 1st, 2018, Nicole Fujita tweeted that she would be returning to the anime series as a voice actor after making her first appearance as Pikarla's Pikachu ♀ (Kurin). 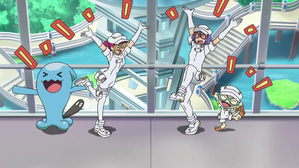 I've done the voice for the cute and fluffy Pokémon Nuikoguma in the TV anime "Pocket Monsters Sun & Moon". Wow, I'm a regular now. The episode airs on the TV Tokyo Network Sunday November 11th at 6pm! Please don't miss out on the cute Nuikoguma.